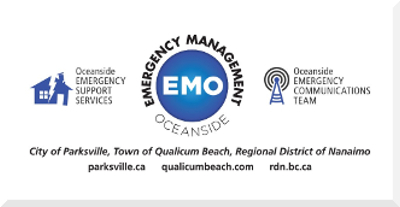 The emergency programs from the City of Parksville, Town of Qualicum Beach and the Regional District of Nanaimo work in unison to provide large scale emergency support and disaster service to Oceanside residents. Through the EMO partnership, there is a more efficient, effective and cooperative approach to managing emergencies in our region. The resources from the three local governments provide professional 24/7 emergency support and EMO has the capacity to develop and undertake preparedness, mitigation, response and recovery planning. The City is a member of Mid Island Emergency Coordinators and Managers (MIECM), a group of emergency managers and coordinators from the Malahat to Port Hardy including Powell River and the Sunshine Coast as well as Island Health and provincial government representatives from Emergency Management BC. This group provides emergency management planning, support and leadership to our communities in an effort to protect people, property and the environment during emergencies. In 2000, MIECM created an emergency plan template for local governments in the region; the City used this format to develop a Parksville plan. Due to privacy concerns and sensitive material in this plan, the release of which is protected by freedom of information legislation, the plan could not be released to the public in its entirety. Responding to public desire to see the plan, MIECM created a new plan template, separating private and sensitive material into operational guidelines which will be used when an emergency operations centre is activated in response to an emergency or disaster. The City has organized the Parksville Emergency Plan content to meet this new format, and is now releasing it to the public. This group of dedicated volunteers provide assistance to people displaced or directly affected by an emergency or disaster. Trained volunteers arrange for food, clothing, housing and access to emotional support for up to 72 hours after an emergency. If you are evacuated from your residence due to an emergency or you do not have insurance against damage to your residence due to fire or other emergency situation, you will be greeted and supported by caring volunteers. EMO is also supported by ECT; volunteers licensed through Industry Canada as radio operators provide communications within the region, throughout the province and around the world using voice and digital radio equipment. Messages can be passed along regarding the welfare of residents to loved ones outside of the region and the needs of the region in an emergency. We can’t do it alone! Both ESS and ECT rely on community volunteers. Although not paid positions, volunteers receive full training paid for by EMO. Training is not required to join ESS or ECT, just a desire to provide a valued service to your community when it is needed most. We are seeking volunteers or those interested in starting a Neighbourhood Emergency Preparedness Group. If you wish info about our programs, contact Chris James, volunteer coordinator, at OESSD@parksville.ca. We recognize not everyone can volunteer but you can still be involved. By preparing yourself, your home, family and neighbourhood with an emergency plan, you can make a difference for yourself and your community. If you are not directly affected by an emergency or disaster and can support yourself for up to a week on your own, emergency resources can then be directed to those people directly affected and in the most need.